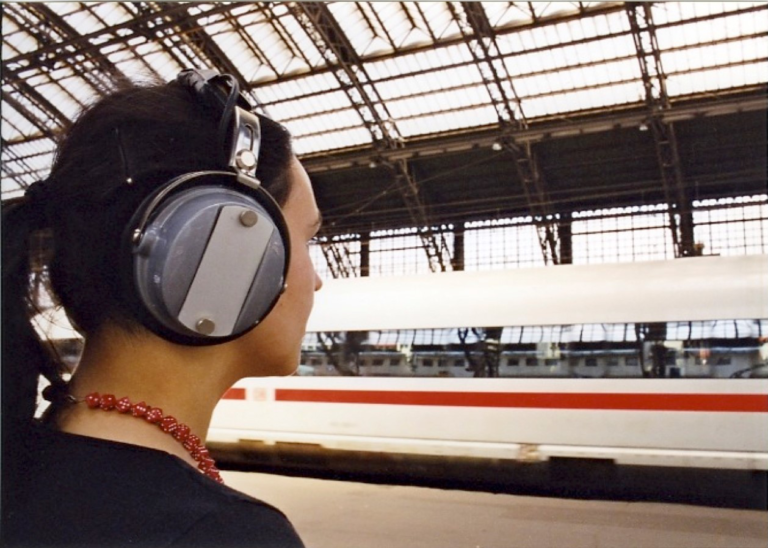 German artist Christina Kubisch, a pioneer of sound art, began using electromagnetic induction in her installations as early as 1978. Since then she has constantly refined her practice of staging the effects of wireless electromagnetic transmissions. 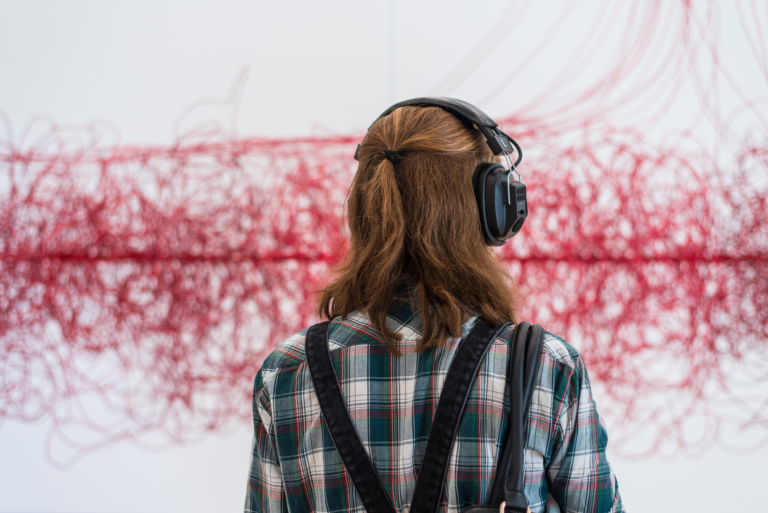 Cloud (2011/2017), produced on-site at the museum using thousands of feet of red electrical wire, hosts a fourteen-channel composition that visitors listen to by wearing customized headphones. 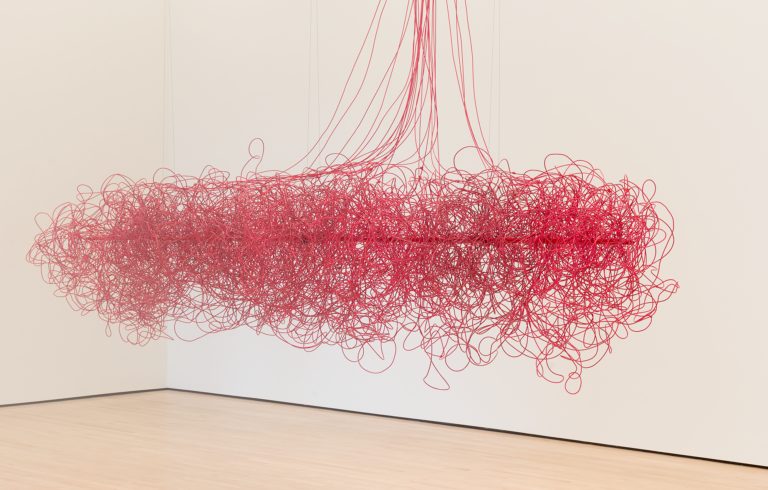 These devices, developed by the artist, contain magnetic coils that receive the magnetic fields circulating in the cable loops and make them audible. 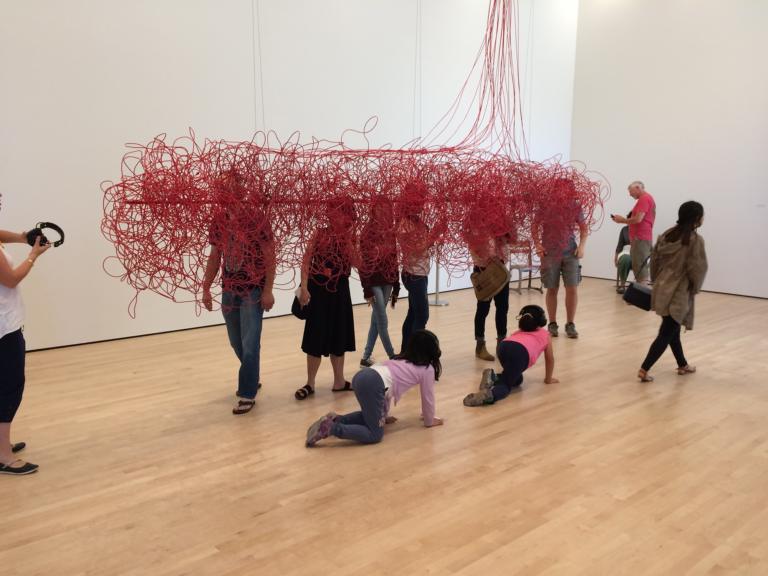 As visitors move around the installation, they look at the chaotic electrical wiring suspended in the gallery but hear the prerecorded sounds programmed into different segments of the sculpture. For the work’s presentation at SFMOMA, Kubisch compiled a sequence of recordings of magnetic fields from various sites, including a security room in the basement of the museum; nearby locations such as Yerba Buena Gardens, a parking garage on Natoma Street, and Epicenter, a city-run space devoted to seismic safety; the Hoover Dam in Nevada; a power plant in Finland; server rooms in Austria, Germany, and Hong Kong; a Louis Vuitton store in Paris; and the Laboratory for Antiquated Video Systems at ZKM Center for Art and Media in Karlsruhe, Germany. These are heard alongside the electromagnetic sounds of Nam June Paik’s TV Crown (1965/1999), a work in SFMOMA’s collection, which was on view during the artist’s first site visit in preparation for Soundtracks, in the spring of 2016. This silent icon of media art provides both an interesting sonic experience within Cloud and a fitting historical reference: the work operates with audio generators, an audio amplifier, and an altered TV monitor, marking one of the first instances in which an artist employed live interaction between a sound system and an electronic image. 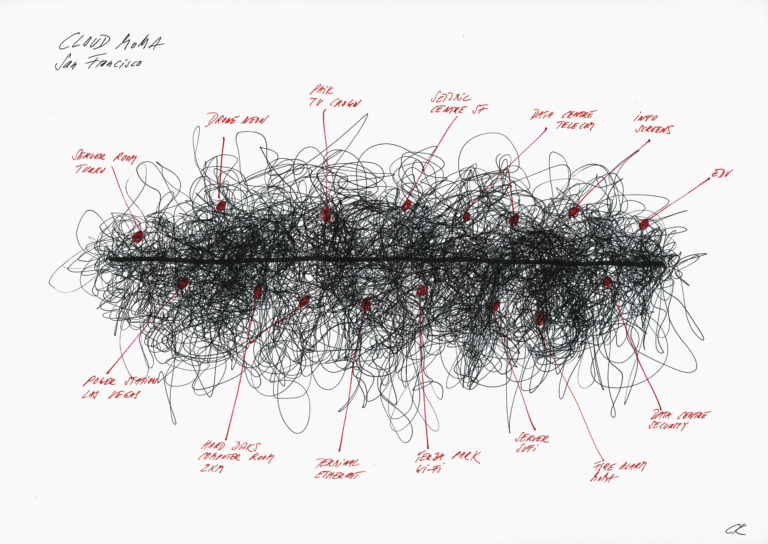 Kubisch started her series of Clouds in 2011, before the term became a Silicon Valley buzzword for a type of data storage. 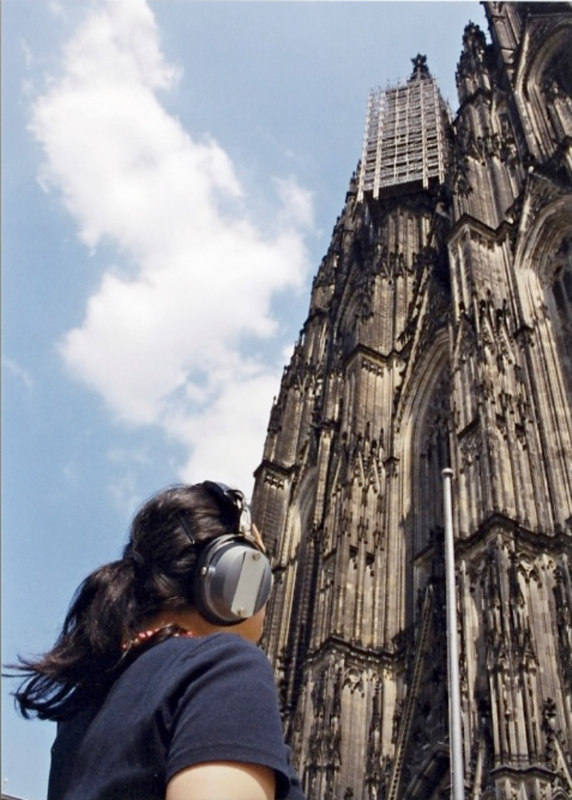 Uncannily, however, her participatory audio sculptures relate to these topics of storage and access, yet they do so in a theatrical way, turning visitors into active listeners who are constantly seeking to retrieve and mix new sonic impressions by bending down, lying on the floor, or simply turning their heads. 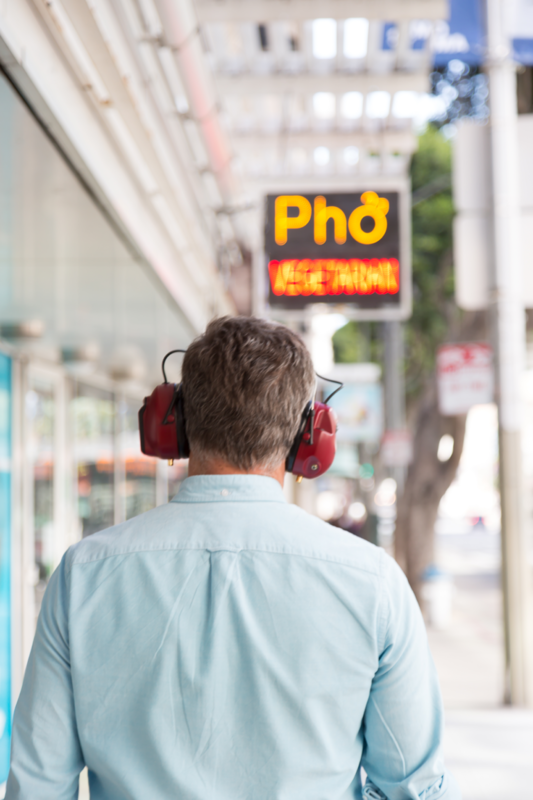 Commissioned to produce a San Francisco walk for this exhibition—the artist’s sixty-fifth work in the Electrical Walks series—Kubisch selected and sequenced signals in the area around the museum that are particularly strong and sonically interesting. 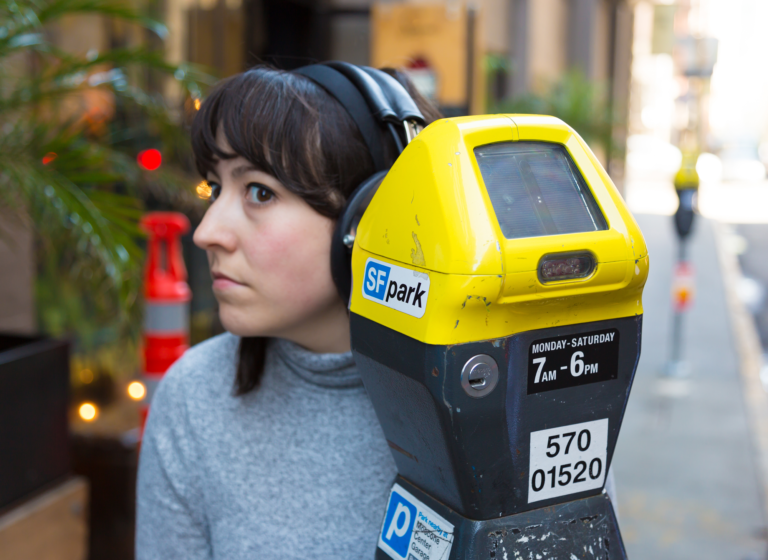 Each walk and each site-specific investigation adds to the artist’s typology of urban sounds. 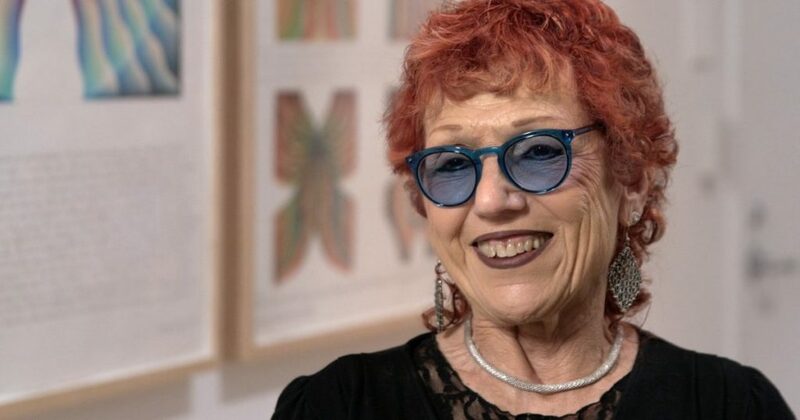 She calls the series an artistic work that is “social research” at the same time. 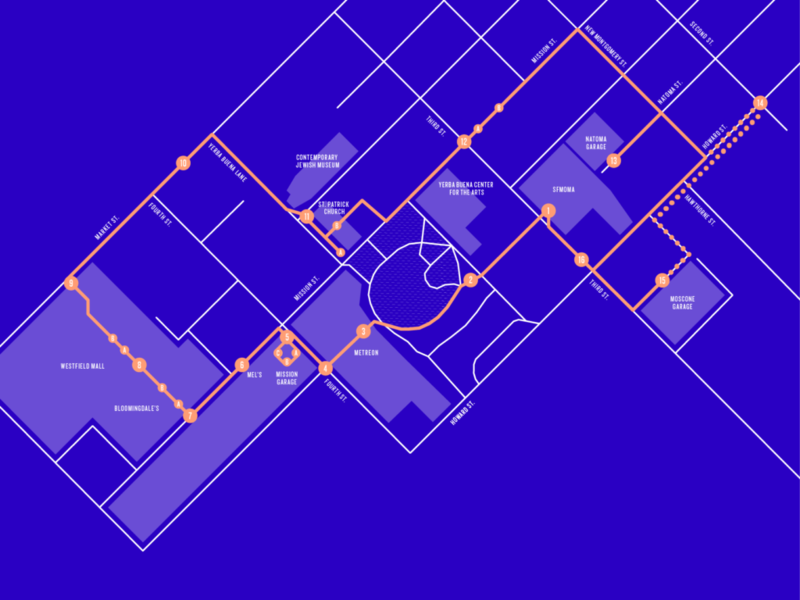 In San Francisco, the walk covers the typical downtown scenery of commerce and new architecture, as well as overlooked and hidden nooks and niches. Kubisch’s approach could be superficially associated with a scavenger hunt, but it is more appropriately described as an “auditory dérive,”3 recalling the situationist practice of wandering the fabric of a city. 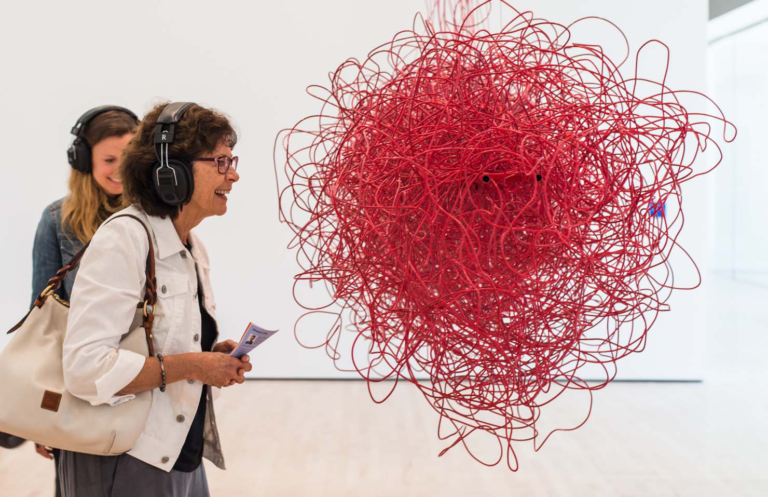 John Cage’s legacy of eliminating the difference between noise and music is equally relevant: one encounters on these walks moments of noise as much as sequences that evoke minimalist or techno music. 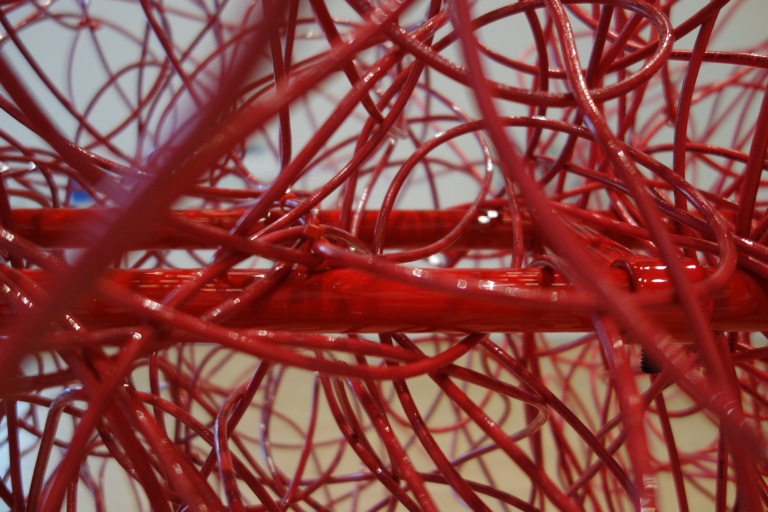 “Electromagnetic Induction,” Christina Kubisch website, accessed May 3, 2017, https://www.christinakubisch.de/en/works/installations/2. All quotes are from Christoph Cox, “Invisible Cities: An Interview with Christina Kubisch,” Cabinet, no. 21 (Spring 2006), accessed May 3, 2017, https://cabinetmagazine.org/issues/21/cox.php. 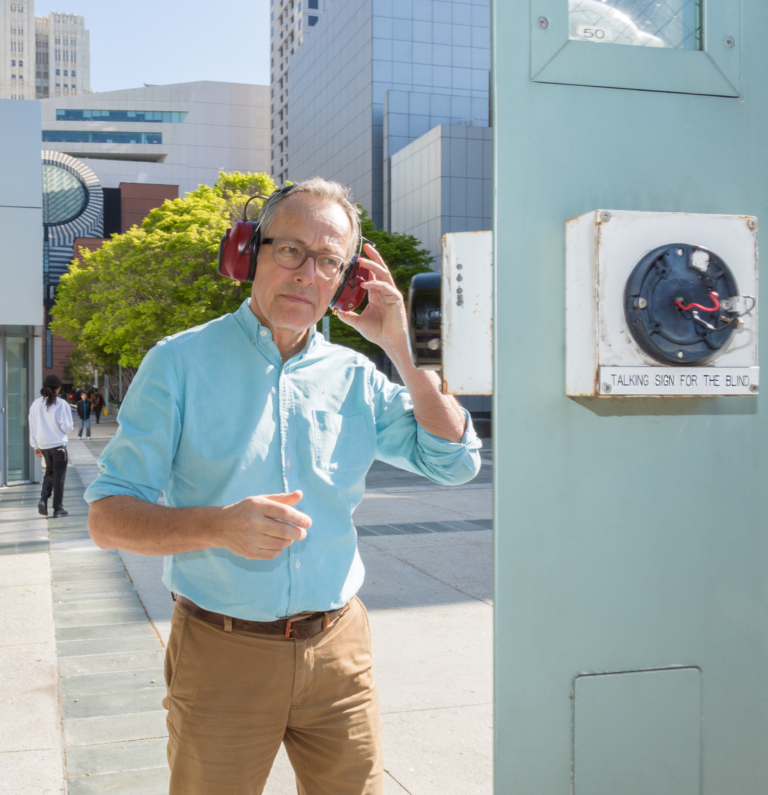 Armed with this map and special headphones, Electrical Walks San Francisco participants are invited to explore electromagnetic fields through sound in the neighborhood surrounding SFMOMA. 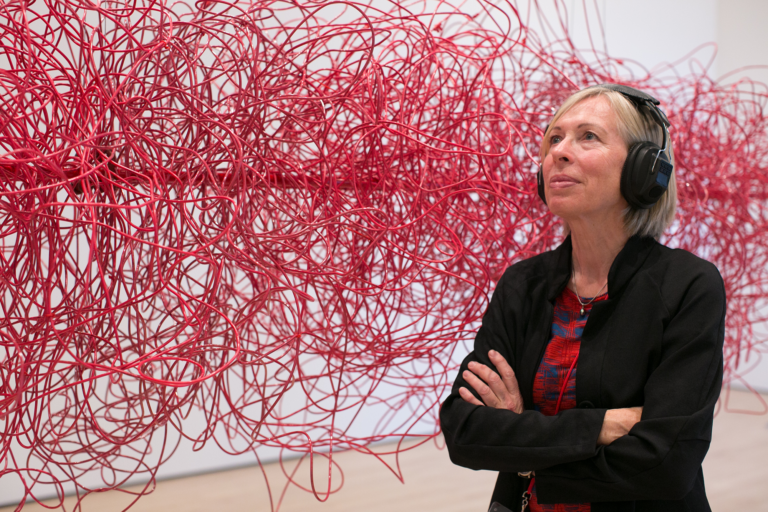 Sound artist Christina Kubisch describes how she discovered electromagnetic induction, the phenomenon at the core of her work Electrical Walks San Francisco(2017), created for SFMOMA’s exhibition SoundtracksIn this participatory piece, museumgoers don hypersensitive headsets that allow them to experience magnetic fields from electrical devices as sound — and in doing so to compose their own live soundtrack as they explore the urban area around the museum.